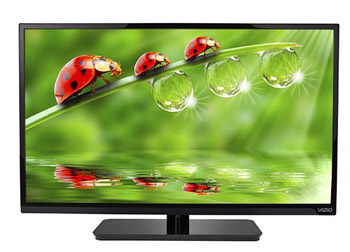 The E370-A0 is a larger version of the basic 32 inch budget LED TV. Its got a 720p resolution with 60hz refresh rate. The design is nice with a thin bezel with a depth of more than 3 inches. It's not super thin, but for the price this TV is perfect for an extra room. The price is the most attractive thing about it. This one can be found for $320 in the right place. The LED backlighting is the reason for a decent picture quality on the E370. You are not getting a 1080p resolution image, but that's okay. A 37 inch screen is not big enough to make a big difference between 720p and 1080p. If you want this to be a computer monitor, that's where you will see a loss in performance due to the 720p resolution. The 60Hz refresh rate is another thing not to worry about. Once again, motion blur is going to be hard to spot on a TV of this size. This TV has a dynamic contrast ratio of 200,000:1 and 16.7 million colors to make for great picture reproduction. Vizio shedded the local dimming feature on this model of the E-series. The E370 loses the Razor LED design that many of the E series uses. This means there is a little more depth to the TV than the others. This one clocks in at around 3 1/2" while the Razor design is less than 2". This may make the E370 less suitable for wall mounting. As you can see the bezels are still less than an inch, and that makes for a great look. It's got the standard square black glossy stand. For $318 the E370-A0 offer a lot of screen for the price. There aren't many TVs of this size with 720p so the competition is not as tough. Toshiba's 39L1350 comes close but has a little better feature set. That one sells for $399. This makes it one of the best 37 inch budget TVs on the market.